I used to dread making egg salad because that meant I had to hard boil eggs, even though hard boiled eggs are one of my favorite snack foods. For years I was not too worried with having perfectly cooked hard boiled eggs because at the end of the day I would just be chopping and mixing everything up and no one would know if the eggs were perfectly cooked or not. Most of the time I would either under or over cook the eggs. Under cooking slightly was never a big issue; however, over cooking the eggs where the green halo would appear was an issue. Recently I decided to try and make some deviled eggs, and I knew that in order to make good deviled eggs I was going to have to learn how to make the perfect hard boiled egg. I have to say that after few different tries and methods I now have a fail safe way to make the perfect hard boiled egg which is also easy to peel! Bring your eggs to room temperate before you begin to cook them but allowing to sit at room temperature for 20-30 minutes. Over high heat bring the water JUST to a rapid boil. As soon as the water reaches a rapid boil, immediately remove the pan from the heat and cover tightly with a lid. Set the timer for 17 minutes for large eggs or 20 minutes for jumbo eggs. Once the eggs are done cooking remove the lid and drain the water. Immediately remove the eggs from the pan and place them into an ice bath for at least 10 minutes. This will stop the cooking time and will also make peeling the eggs much easier! A quick test to ensure that your eggs are hard-boiled: When the eggs have cooled, spin them on a hard surface, just like you would spin a top. 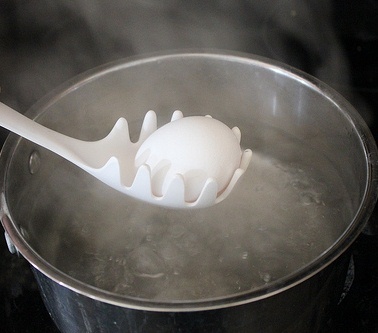 If the egg spins quickly and without taking off in one direction, the egg is hard boiled and finished. Under cooked eggs will have a very wobbly and unsteady spin to them. Refrigeration is necessary for hard-boiled eggs if the eggs. You should not to peel your eggs until you are ready to eat or use them in your recipe. Hard-boiled eggs in the shell can be refrigerated for up to one week. Peeled hard-boiled eggs can be stored in the refrigerator in a bowl of cold water to cover for about 1 week; however, you will need to change the water daily – or in a sealed container without water, cover the eggs with damp paper towels, for the same length of time. SAFETY NOTE: It is not safe to leave hard boiled eggs, including those in their shells, out at room temperature for long. If they have been taken to a picnic, or served on a buffet, keep them cool while they are being served, and discard any leftovers.